Japanese pumpkin esp. Cambodia abobora kabocha is a juice pumpkin without much sweetness. Recently in Japan, sweet non-Japanese pumpkins have been gaining popularity. 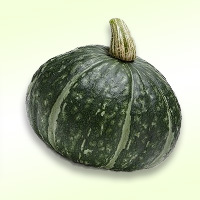 It is commonly called the kabocha squash in the US and Canada. However Japan uses kabocha to refer to both pumpkins and squash collectively. The calories in Kabocha per 225g(1/4piece) is 110 calories. Kabocha is calculated to be 49Cal per 100 grams making 80Cal equivalent to 163.27g with 24.53g of mostly carbohydrates、3.6g of protein、0.23g of fat in 225g while being rich in vitamins and minerals such as Vitamin K and Folate.